The “Nine Lives Tarot”, skillfully illustrated by Australian artist/designer Annette Abolins, represents the artist’s creative and spiritual perspective on life. The illustrations are figurative, portraying experiences in life as a visual story. Whilst admittedly a free interpretation of the Rider-Waite-Smith system, additional inspiration has been drawn from imagination, mythology and from people close to the artist, whilst finding a deeper symbolic meaning to the ups-and-downs, opportunities and mysteries encountered on the path. Above: Nine Lives Tarot major arcana designed by Annette Abolins, 2013. The four court cards in each of the suits of pentacles, rods, cups and swords represent personal influences in the realms of the home & hearth, spirit & creativity, the heart and the mind. Each suit is coded according to its association with star signs as well as the elements of earth, fire, water and air respectively. 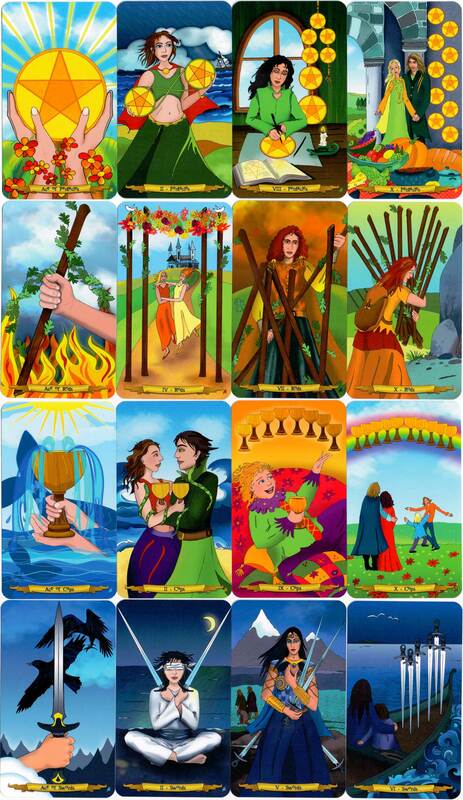 The colourful and life-affirming illustrations include visual connections between the cards to suggest different aspects and phases of Self. Above: the 16 court cards, Nine Lives Tarot, designs by Annette Abolins, 2013. The minor arcana cards represent everyday situations, depicted in terms of prosperity, creativity, love and the mysteries of the mind. Thus, current influences from within the different suits provide clues to help better understand challenges, seize opportunities or confront life-changing events depicted in the archetypal, major arcana cards, thereby revealing the ‘bigger’ picture. Above: the minor arcana numeral cards from Nine Lives Tarot, designs by Annette Abolins, 2013. 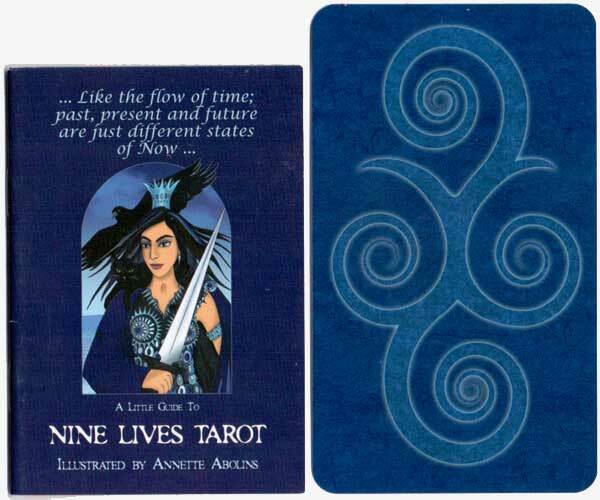 Above: The “Nine Lives Tarot”, illustrated by Annette Abolins, contains a total of 78 cards plus an explanatory booklet in a box inside a blue drawstring bag. 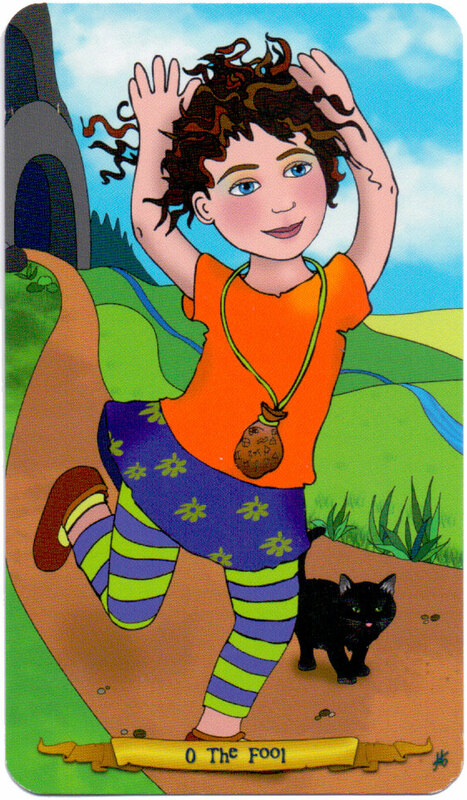 The booklet includes descriptions and symbolical interpretations for all the cards, which are inspired by the Rider-Waite-Smith tarot, but the artist suggests that the characters should introduce themselves. There are no reverse meanings in this deck except that a reversed card may indicate a delay of the meaning.